Jamie came home from school on a Friday complaining of a sore throat. I assumed he was coming down with a cold and told him to rest up that evening and I would look at his throat in the morning. The next morning his lymph node was swollen to the size of a baseball. I took him to the walk-in clinic to be evaluated, and they stated it was a simple virus that needed to run its course. That evening Jamie began running a fever. By bedtime he was lethargic with a high fever, his heart was racing and he was breathing heavily. We took him to the local ER where they took him back immediately thinking he may have meningitis. After being checked out by the doctor, noting his high fever and high heart rate they stated they believed it was just a viral infection and didn’t want to put him through rigorous testing just yet. They discharged him on antibiotics and told us to follow up with his doctor on Monday. All day Sunday I watched as he whimpered in pain, and despite rotating his fever medicines, and the strong antibiotics he still was not improving, and the fever wouldn’t stay down. By Sunday evening Jamie could not stand to walk himself to the bathroom, crying in pain that his legs hurt. First thing Monday we took him to see his pediatrician. His doctor noted he had red eyes, and with the swollen lymph node and the high fever and thought it warranted a trip to the Children’s Hospital to be evaluated for something known as “Kawasaki” but told us not to fret, it was very rare and was likely not it but we should go just to be safe. 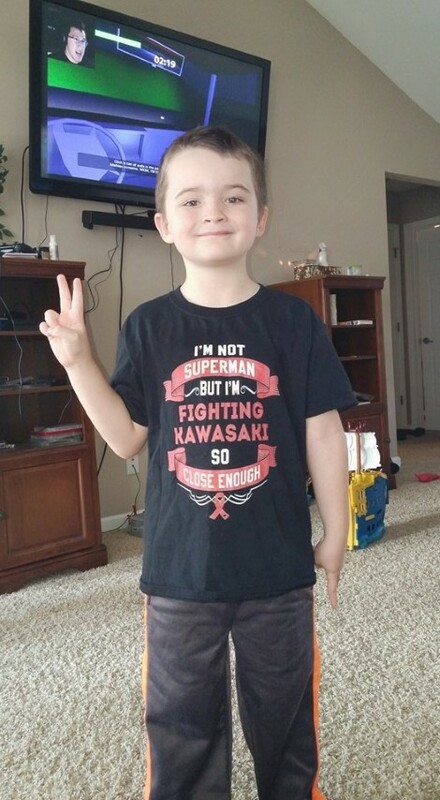 We traveled up to the children’s hospital, and Jamie was admitted to the hospice care team.The hospice team informed us that it was silly our pediatrician had even mentioned Kawasaki to us as Jamie was not showing enough symptoms and he was simply too old. Overnight they gave him strong antibiotics and medicine for his fevers. By the next day in the afternoon Jamie had begun to perk up and was asking for water, The doctors stated since he was acting better and requesting drinks they didn’t feel he needed to stay any longer and were confident it was a bacterial infection in his lymph node. They told us to follow up with his pediatrician in 2 days, or call if he wasn’t any better. The next day Jamie seemed to be feeling better on the antibiotics, but as the day went on, he slowly started to feel bad again. By early next morning Jamie awoke with another high fever, unable to get himself out of bed and was crying in pain. I called the doctors office and was told his doctor was out of town but they could send him to another office. That evening we met with a different pediatrician. I carried Jamie into the office to be seen and he was checked out. Unfortunately at the office Jamies fever had just broke and the nurse only registered 99.5. I explained to her that it was low now but in a matter of an hour his fever will spike again despite rotating the fever reducers. The doctor told us that he was pretty sure it was Kawasaki Disease, He told us to go home get some things ready, eat a good dinner and then head to the children’s hospital again and he would call ahead and request the Infectious Disease doctor to evaluate him. When we arrive to the children’s hospital again we had to go through the ER first. Once again we were told by the doctors that it was likely not KD and they would just need to keep him overnight on a different antibiotic. The admitted him again and the next morning the infectious disease team came into Jamie’s room. They explained to us that Jamie wasn’t exhibiting all signs of Kawasaki Disease and for that reason, they couldn’t treat him yet, so they were going to run some blood tests and keep him for another night to watch him. The next morning after a night of high fevers they came and stated they were going to do a test known as an echocardiogram to check Jamie’s heart just in case as the Kawasaki could cause damage, “if” that’s what it was. That evening they came in to tell us that they were going to start a treatment on him known as IVIG as Jamies heart had shown changes showing them that he did have Kawasaki Disease despite showing all the symptoms they were looking for. We questioned what they meant by showing changes in his heart and were told that cardiology would be in to talk to us later. So for 12 hours they ran this medication called IVIG through his weak body. They came in every half hour to check his vitals and make sure he was tolerating the medication well. By morning Jamie was already showing just how well the medicine was working, he was requesting food after not eating in days, and he stood on his own to go the bathroom. The doctors let us know that they were going to keep him one more night to be sure the medication completely worked and cardiology would be in the next morning. That night Jamie began to have fevers again, he became lethargic and non respondent. They told us they were going to do more of the medicine IVIG through the night. Again we stayed up all night watching the medication and the nurses coming in and out. The next day Jamie was feel well again. This time the medicine had worked. That afternoon the cardiology team came in to talk to us about what they had seen on the test that was done 2 days before. They informed us that Jamie’s heart had shown significant changes in his left anterior descending coronary artery. He had two aneurysms that were classified as Giant Aneurysms. After you hear something like that everything else becomes quite and you cant focus. They explained that he would need medicine for the rest of his life, and that his lifestyle would change. We have learned a lot more now than we did that day….Jamie has three giant aneurysms in his LAD after more tests and changing specialists. He sees cardiology, hematology and even rheumatology for pains in his legs he still has since having Kawasaki. Life is definitely different now, but after almost 2 years it has become our new normal. and Jamie as finally adjusted to the changes in his life including taking shots and medicines every day to stay healthy. Thank you for reading our story. Takes Lovenox injections, Warferin, and Aspirin. Frequent heart checks and blood checks. Still has pain and weakness in legs. Overall, He is happy kid still despite KD.